September 2011 marked the 40th anniversary of the historic prison rebellion at the Attica State Correctional Facility in upstate New York—a dramatic civil rights protest that ended with Governor Nelson Rockefeller ordering over 600 state troopers to storm the prison and retake it with force. As a result of this forcible retaking 39 people were shot to death—hostages and inmates alike—and scores of other prisoners were severely wounded and tortured for days. Rochester's own Chris Christopher and Dave Marshall, the multiple Emmy Award-winning filmmaking team, reveal the story of what really happened during the 1971 Attica prison riot in Criminal Injustice: Death and Politics in Attica, airing Wednesday, September 7, 2016 at 10 p.m. on WXXI-TV. 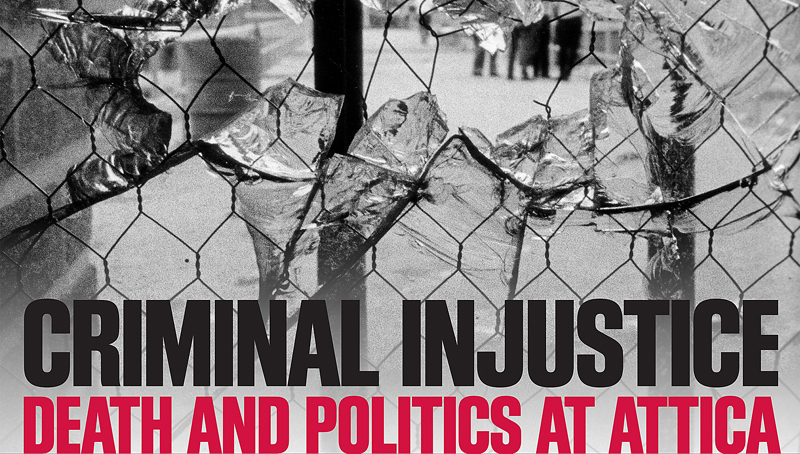 Criminal Injustice: Death and Politics at Attica brings this historical event to life in completely new and startling ways. Based on scores of interviews of eyewitnesses who just now are telling their stories, as well as filmmaker access to newly discovered documents, Criminal Injustice brings genuinely new evidence to light regarding what exactly happened at Attica between September 9-13, 1971 and the role played there by local, state, and even federal officials. Indeed this film raises important new questions about the deaths caused at Attica, about the involvement by individuals in the White House at Attica, and the influence of Nelson Rockefeller's political aspirations on decision made before, during, and long after the controversial and deadly retaking of that prison. Forty years after this cataclysmic and highly charged event, filmmakers Marshall and Christopher found that many are willing to speak with new candor that adds depth, and in some cases alters, the historic record. The film includes the final interview regarding Attica given by NYT reporter Tom Wicker (who was an observer/negotiator on the scene and author of A Time to Die about his experiences at Attica), Malcolm Bell, the special prosecutor turned whistle blower, Dr. Heather Thompson who is the nation's leading academic authority on the Attica prison uprising -- as well as inmates, former hostages, law enforcement officers and others.